Manfred Lewandowski was born in Hamburg, Germany on 1 September in 1895 to a family of cantors. Manfred was Louis Lewandowski's great-nephew and his father, Isidor, was a cantor in Hamburg. Young aaManfred first sang in a synagogue choir in Hamburg from 1906 to 1912; the cantor at the time was Yossele Rosenblatt, who became Lewandowski's teacher. 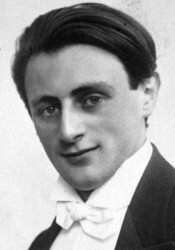 In 1921 he became cantor in KГ¶nigsberg. From 1923-1928 he was the cantor of the Friedenstempel in Berlin, and from 1928-1938 of the Synagogue on Lindenstrasse.In addition to his cantorial activities, Lewandowski sang regularly on various radio stations in Germany from 1924-33, where he sang both operatic roles and songs. He fled Germany in 1939, going first to Paris and eventually to the United States. From 1939-40, he sang at a synagogue in New York, and from 1940-48 in Philadelphia, and he is known to have appeared as a cantor as late as 1965. 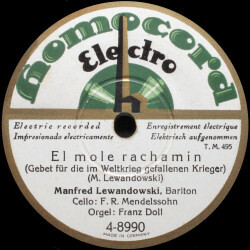 Lewandowski died in Philadelphia on 8 September in 1970.